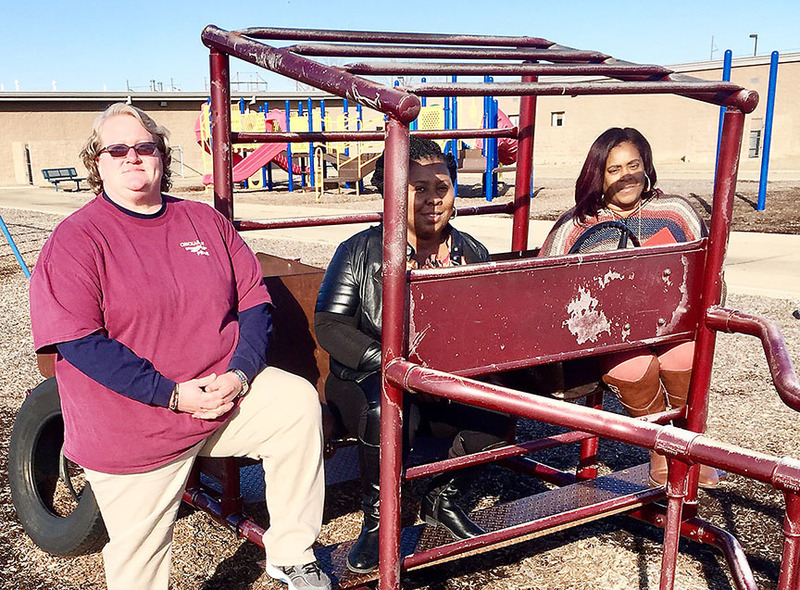 The persons involved with the decision to add new playground equipment to the recess area at Blytheville Primary School are (from left) project coordinator Paula Pitts, PTO president Sherrie Clay and playground committee chairperson Melissa Logan. The plan is for the Primary School to add some new equipment for the playground because, said principal Jana Wilson, some of the equipment is old and needs to be updated. Leaders of Blytheville Primary School and its Parent-Teacher Organization have officially begun a campaign to significantly improve the playground for their first and second-graders, introducing their plans at an assembly that included all the teachers and every student in the school. PTO president Sherrie Clay, Melissa Logan, committee chairperson over the playground project, and other persons participated Jan. 24 in a kickoff activity advertising the fundraising project that included all the staff members and students. The Primary School facility, which took nearly two years to build, officially opened Jan. 20, 2006, and since then the playground has not featured any new equipment. “The impetus for (the fundraiser) is that the current equipment isn’t sufficient to meet the needs of the students,” said Logan. Clay and Logan both have children who are students at the Primary School. Paula Pitts, BPS’ physical education teacher and the project coordinator, Blytheville School District Maintenance supervisor Don Jenkins and members of his maintenance team perform a monthly safety checklist of all the BPS equipment. What they discovered is that some equipment had been damaged by the weather and other natural causes, but also some just needed to be repaired. “A state mandate requires us to inspect all the playground equipment every month; some items just needed repairs, which were done immediately,” said Jenkins. He also said that some of the equipment, including an old fire truck, are very old and should be retired, and the plan is for his crew to dig up the truck this spring. Wilson added that PTO members researched playground components to get an estimate for the project. Committee members developed a list of 13 components for consideration for the project, which include fitness systems, play systems, climbers, spinners, slides and a merry-go-round. Clay added that any donations to the playground project will be appreciated and sponsorships are available in many levels, corporate down to a family level. According to Logan, the PTO members have not yet officially begun seeking sponsorships among the Blytheville businesses and industries. All playground sponsors will be recognized on the BPS website and will be permanently recognized at the playground site on the school’s donor wall. Depending on what is purchased by the PTO, Wilson said that a few months would be necessary for the new equipment to be installed. She also stated that some PTO funds for the playground already exist, but the vast majority of funds will have to be raised. Nucor is donating 10 tree seedlings to planted in the playground area, Wilson stated. “The seedlings will consist of a variety of trees: Cypress, northern oak and pine. Five will be planted on the kindergarten playground and five on the first and second grade playground,” she said. BPS students are also selling cookie dough, cheesecake and pizza as a fundraiser for the new equipment.